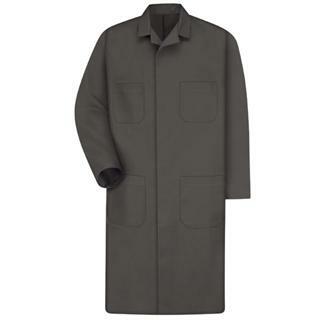 Red Kap Mens Shop Coat Look sharp around the shop with the four-pocket shop coat. The longer length and concealed gripper front keep dirt and grime off while youre on the job. PROVEN DURABILITY. Red Kap challenges industry experts to put our workwear to the test. We test, tweak, and repeat until its Done Right. VENTED COMFORT. Side vent openings allow easy access to your tool belt and a vent in the back helps keep you cool. LONG LENGTH PROTECTION. 43 1?2"" length provides barrier between your clothes and grease. ZERO SCRATCH Paint jobs and surfaces stay scratch free thanks to strategically-designed garment features that keep buttons and snaps under wraps. WRINKLE-RESISTANT Wrinkle-resistant finish for minimal ironing and keeps you looking professional all day. DESIGNED WITH PRIDE. DONE RIGHT.